Plant of the month. 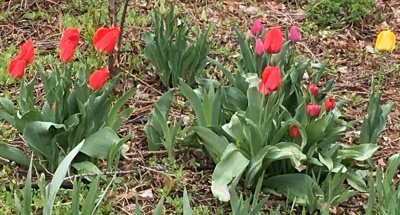 May 2016 TALK ABOUT OLD SCHOOL…TULIPS FROM THE 10TH CENTURY – Glacier View Landscape and Design, Inc.
Tulips have been around for a very long time. They were first cultivated in Persia around the 10th century, and by the mid 1500’s were imported to Western Europe. They were brought to the United States around 1850 to some famous gardens in Massachusetts. Tulips are a bulbous perennial flower that loves long cool springs and warm dry summers, ideal in our Boulder Colorado landscapes. They need a period of cold dormancy called vernalization. Again, perfect along the Front Range of Colorado. They come in almost all colors except pure blue…though some are called blue with a hint of lavender color. Tulips are easy to plant. As with all bulbs, the rule of thumb is to plant the bulb with the top or pointy part of the bulb facing up and 3 times as deep as the diameter of the bulb. So the top of a 2” diameter bulb should be planted at 6” depth. As with most plants in Colorado’s clay soils, amendments are a must. A scoop of bone meal in the bottom of the hole will add a touch of phosphorus which will greatly aid in the health and vibrancy of the flower. Tulips are in full bloom at the beginning of May most years in Colorado….this year is no exception, and our cool moist spring has helped them last longer and present great color intensity. Bulbs should be planted in the fall, in October. This gives them time to set out some roots, but not enough time for them to send a new shoot to the surface. Tulips are a great way for homeowners to add spice to their landscape and feel as though they have contributed to the overall landscape. They do not need to have drip or spray irrigation to them, so cutting back some weedbarrier, digging a hole, and adding bulbs in the fall is a great way to bring a splash of early color to your yard. Plant 10 or 200 this coming fall and see the surprising results of your work just a few short months later.